I’m standing atop an abandoned gun battery in California’s Marin Headlands, gazing southeast toward San Francisco’s Golden Gate Bridge, imagining a time when eager young soldiers stood where I stand, scanning the swells outside San Francisco Harbour for hostile ships on the horizon. The concrete mass beneath my feet is Battery Rathbone-McIndoe. 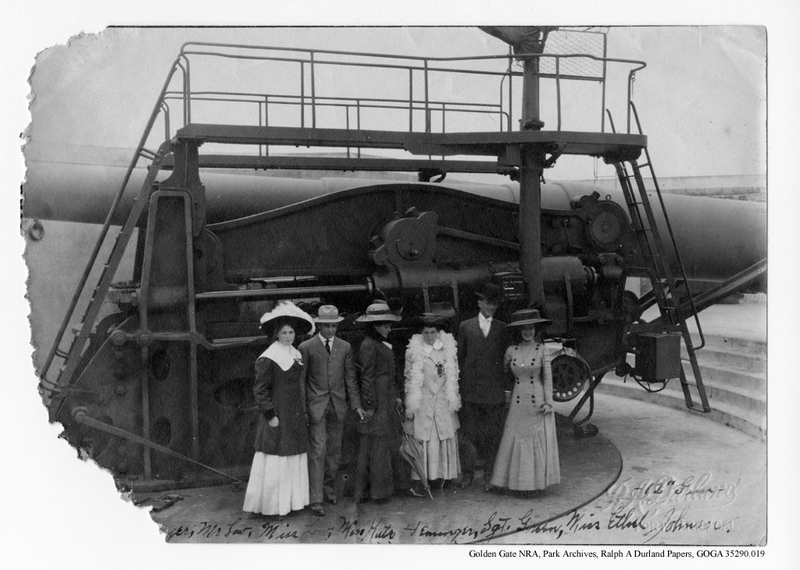 Once armed with four pedestal-mounted guns, this artillery post was part of an intricate defense system for San Francisco Harbour – one that dates back to the early 1900s. 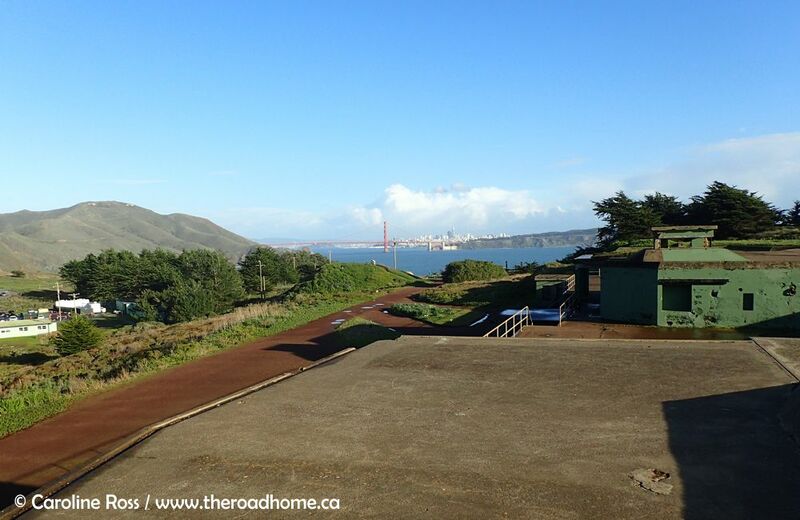 The United States Army eventually built 13 gun batteries along the coast of the Marin Headlands, all with their sights trained on the sea until after World War II. I’ve encountered the ruins of just one of these installations, and already I can feel the ghosts of the past tugging at my sleeve. The Marin Headlands comprises some 2,000 acres of rugged coastal hills, wave-battered beaches and rolling scrublands on the north side of the Golden Gate Strait, the mile-wide channel (now spanned by the Golden Gate Bridge) that links San Francisco Bay to the Pacific Ocean. The Headlands are protected as part of the Golden Gate National Recreation Area, which is perhaps why the remains of batteries like Rathbone-McIndoe still exist to whisper secrets in visitors’ ears. A looping drive through the Headlands gives easy access to five of the earliest batteries built here. The structures went up between 1901 and 1905 as part of a nation-wide strategy to modernize and strengthen America’s coastal fortifications. In 1885, United States president Grover Cleveland convened what became known as the Endicott Board, a War Department committee chaired by Secretary of War William Endicott charged with reviewing and enhancing America’s coastal defenses. Existing fortifications were deemed too sparse and outdated to adequately protect the country’s new coast-to-coast territory and growing industrial infrastructure. It was time for the U.S. to assert military dominance over its coastline. The Endicott Board decided that the best means to this end was to install state-of-the-art concrete gun batteries at 22 coastal ports, including San Francisco. 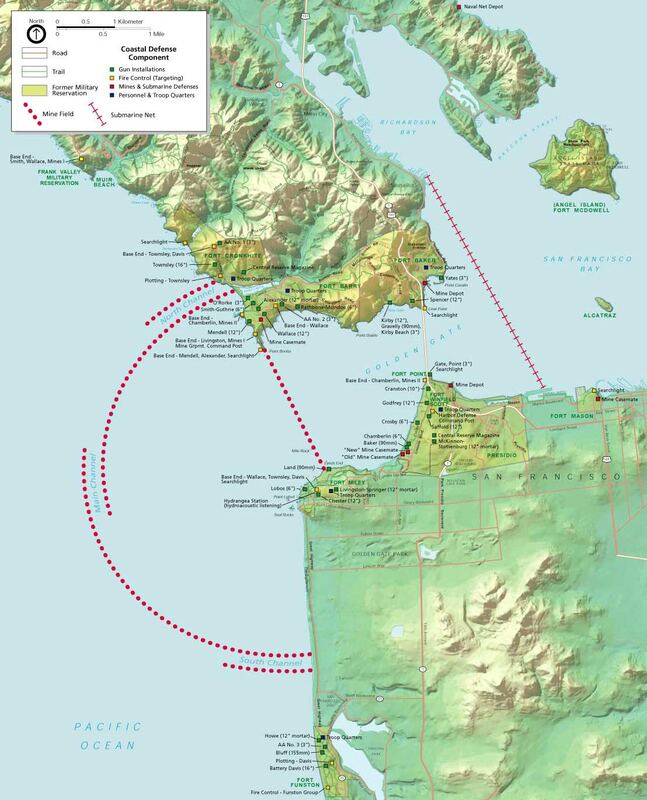 Because San Francisco was also identified as the nation’s second-most strategic port after New York, the Bay Area would receive a network of batteries and supporting infrastructure to safeguard the Golden Gate Strait from all angles, with guns installed in both the Marin Headlands to the north and the San Francisco shoreline to the south. There are five “Endicott-era” batteries in the Headlands: Battery Alexander, Battery Mendell, Battery O’Rorke, Battery Rathbone-McIndoe and Battery Smith-Guthrie. All are easily accessible by driving or cycling a scenic 8.5-mile (14-kilometre) loop along Conzelman and Field Roads, east off US-101 near Sausalito. 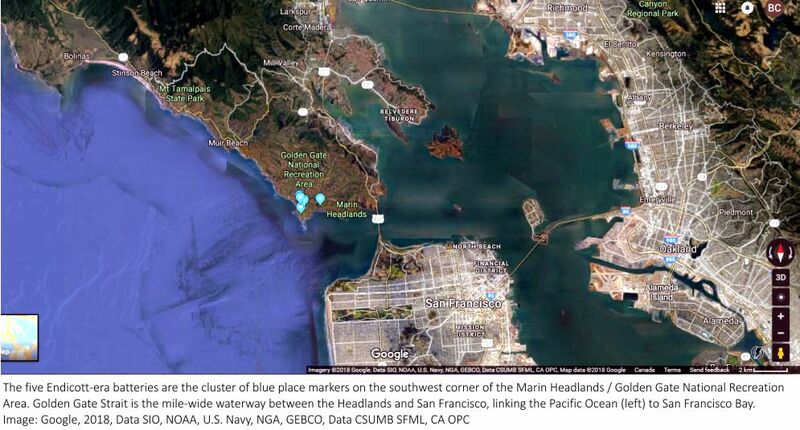 View map placing the Marin Headlands in context of the larger San Francisco Bay Area. 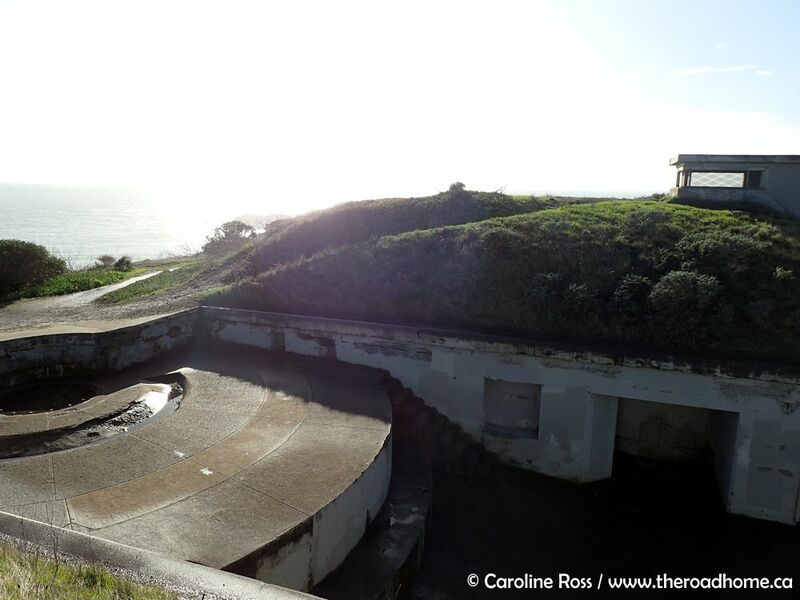 The first battery you’ll come to on Conzelman Road (shortly after descending a jaw-dropping 18 per cent grade) is Battery Rathbone-McIndoe. 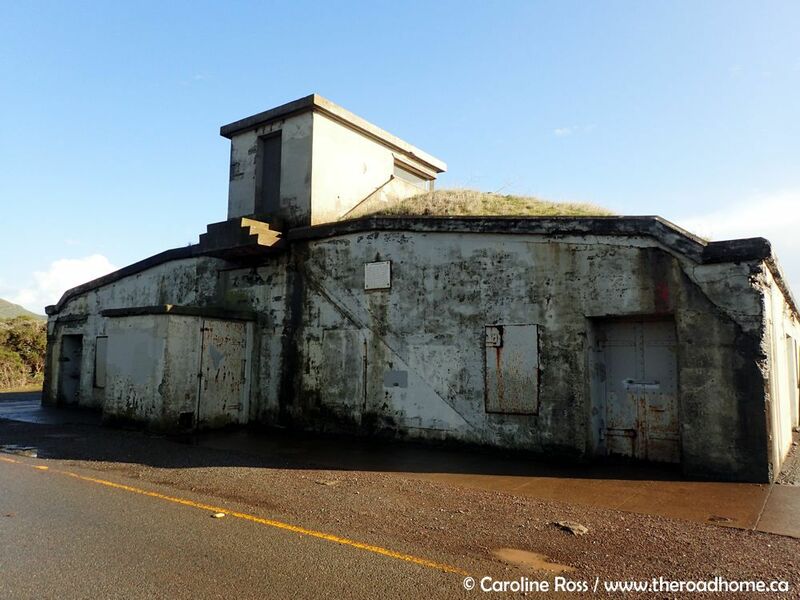 Set right on the road, directly overlooking the Golden Gate Strait, this battery was constructed in 1904 and began its life as a single four-gun unit. In 1922, it was split into two double-gun units – Rathbone to the west and McIndoe to the east – to improve weapons management. Battery Rathbone-McIndoe had four of these M1900 six-inch guns mounted on rotating pedestals. The guns fired 100-pound shells — highly explosive and armour-piercing — up to 8 miles (13 kilometres). Photo: U.S. War Department (U.S. Archives), Public Domain. Climb to the battery’s upper platforms for a better view of the structure’s layout. 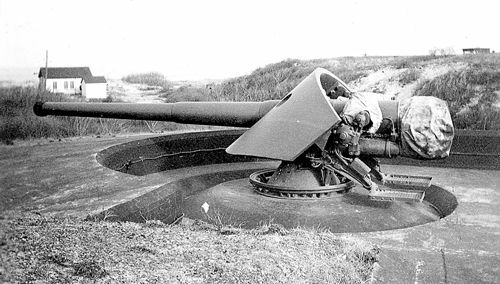 The battery’s four M1900 rapid-fire guns would have sat in the four circular depressions, their six-inch-wide barrels aimed seaward. Soldiers would have stocked and stored ammunition in the two large powder magazines at each end of the structure, and watchmen would have scanned the seas and monitored progress from the command towers atop each magazine. 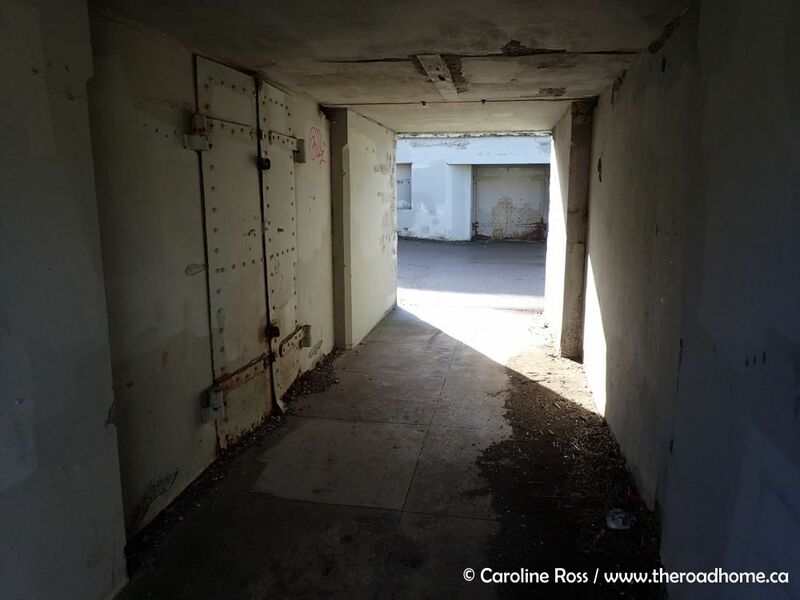 Soldiers would have passed their shifts, plotted firing angles and huddled out of the weather in the central guard room and corridor between the two parts of the battery. Battery Rathbone-McIndoe also provides a spectacular view of this region’s contrasting landscapes: look left, and you see San Francisco and the Golden Gate Bridge emerge from behind barren, scrubby, 923-foot (281-metre) Hawk Hill, one of the Headlands’ highest points and a popular place to look for raptors. A bench beyond the battery offers a bird’s eye view of the rock-rimmed beach below. Next, follow Conzelman and Field Roads to the parking lot for Point Bonita Lighthouse, where you will find a short path leading to Battery Mendell. Battery Mendell, constructed in 1901, was the first of the Headlands’ Endicott-era batteries to take shape. Perched atop a 235-foot (72-metre) seaside cliff as far west on the Headlands as possible, this two-story battery offered unobstructed views and featured what were then the largest and most technologically advanced guns in America: two 12-inch “disappearing cannons” that popped up to fire then dropped down behind protective parapets for reloading. Each gun could launch a 1,000-pound shell up to 8 miles (13 kilometres), ensuring that enemy ships stayed farther from the Bay Area than ever before. Mendell is a maze of crumbling passages, disintegrating doors and quiet corners. Take in the expansive views, study the interpretive signage and pause to contemplate the scale of the landscape in which this battery is set. Then, turn to the hills behind you, where Battery Wallace, set into the high hillside, was by 1921 firing high-angle guns that could strike targets nearly 16 miles (26 kilometres) out to sea – guns that relegated Mendell’s big cannons to the realm of old technology. Now cruise along Field Road to the parking lot for Battery Alexander, from which a 0.6-mile (one-kilometre) circular footpath snakes in and out of Batteries O’Rorke, Smith-Guthrie and Alexander, the last of the five Endicott-era fortifications on the Headlands. Battery O’Rorke, built in 1903, is the northernmost battery. It sits high on the hills overlooking Rodeo Beach, a large, sheltered, landing-worthy expanse of sand on the Headlands’ otherwise rugged west coast. O’Rorke was positioned specifically to protect this beach from enemy incursions. 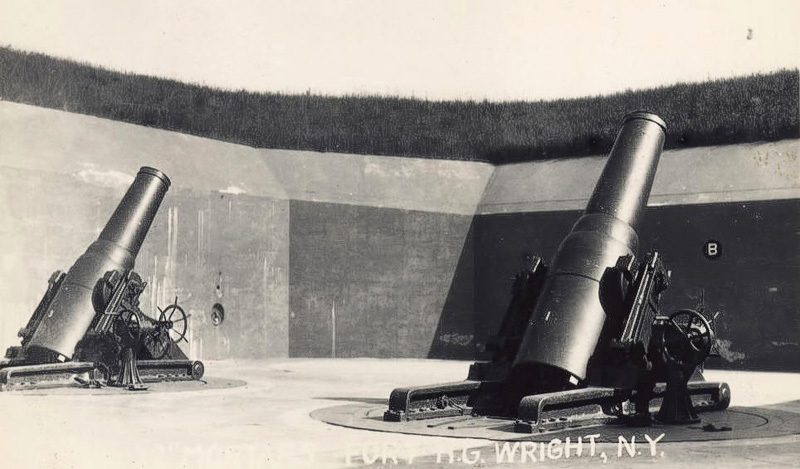 The battery’s four, three-inch-diameter guns could propel 15-pound shells five miles (8 kilometres) seaward, and could be loaded and fired much more quickly than the larger guns at the other Headlands batteries. Today, O’Rorke is a colourful splash on the landscape, its low concrete walls covered with bright graffiti. Look right from atop the battery to see Rodeo Beach, Rodeo Lagoon and Fort Cronkhite, a World-War-II-era U.S. Army mobilization post, now owned by the National Park Service. On the hill just above and south of Battery O’Rorke is Battery Smith-Guthrie, also constructed in 1903. 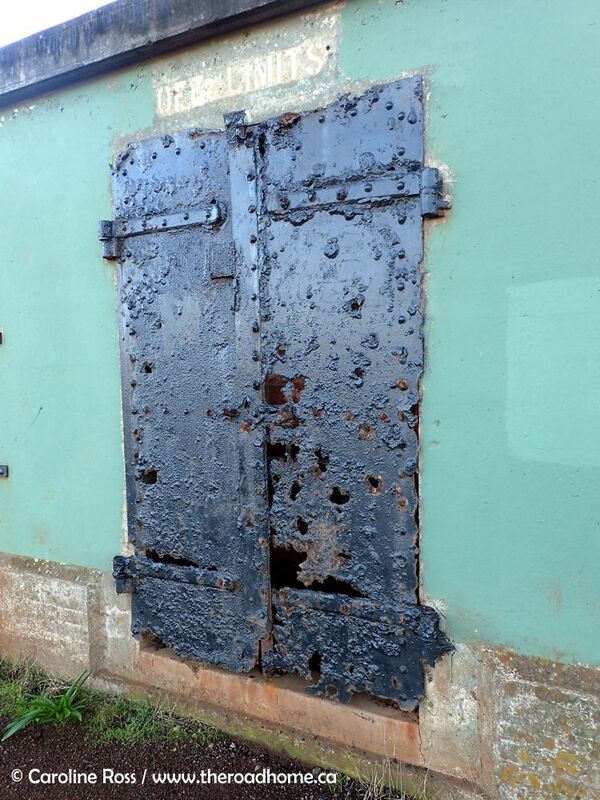 This battery was almost identical in design and armament to Battery Rathbone-McIndoe – right down to the fact that it, too, was split into two separate management units in 1922. Today, set back from the water, its entrance path shaded with trees, Battery Smith-Guthrie has a forgotten, forlorn feel to it. Finally, hidden at ground-level amid the trees behind the parking lot, is Battery Alexander, built in 1902 and unique from its brothers in that it employed mortars, not guns. While the guns of the preceding four batteries fired in relatively long, level trajectories – and needed high, open positions to function efficiency – mortars fired in short, high arcs that dropped shells on targets – like the unprotected decks of ships – from above. Battery Alexander is thus situated on low ground, near the centre of the larger Point Bonita peninsula. Its two recessed square platforms are nestled into the earth. Each platform once housed four Model 1890 breech-loading 12” mortars, one at each corner. Each mortar could fire up to 8 miles (13 kilometres) in any direction, thus targeting enemy ships in either the Golden Gate Strait or the western Pacific Ocean. 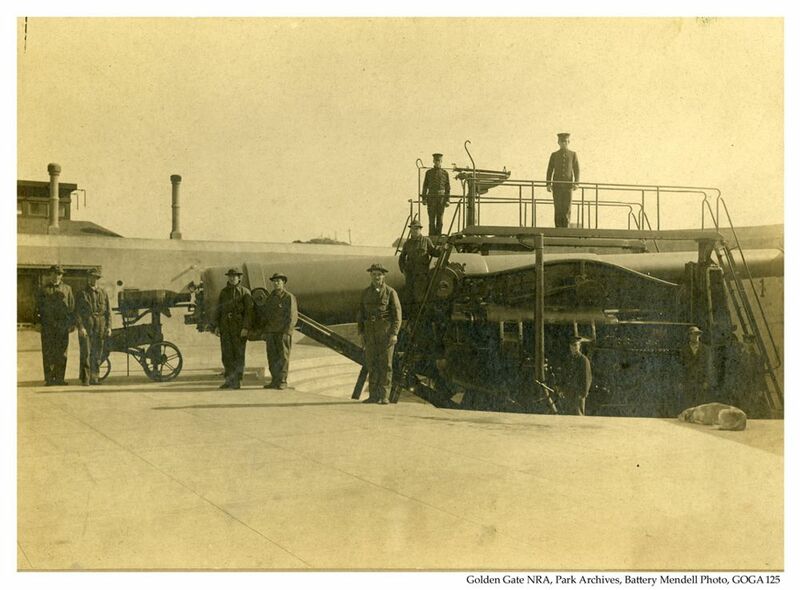 Battery Alexander was the only mortar battery located on the north side of the Golden Gate Strait. Today, the battery’s pits serve as picnic areas, where visitors can sit and snack alongside the ghosts of soldiers past. What was life like for the hundreds of soldiers posted to Batteries Alexander, Mendell, O’Rorke, Rathbone-McIndoe and Smith-Guthrie in the early 1900s? Isolated and uneventful, yet comfortable and enviable, might be the answer. Although the Headlands batteries never once fired at enemy forces, they were consistently staffed by over 100 soldiers from the Coast Artillery Corps, the branch of the U.S. Army responsible for coastal, harbour and anti-aircraft defenses from 1901 to 1950. These soldiers and their support personnel lived at Fort Barry, an army post established on the Headlands in 1908. Fort Barry lay northeast of the batteries, along Simmonds Road. 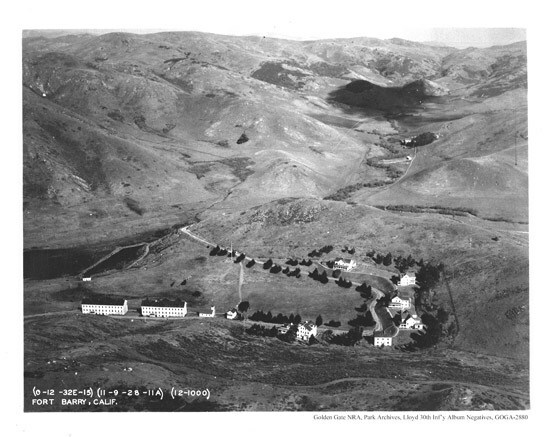 It functioned as a small, self-sufficient community, complete with soldiers’ barracks, officers’ residences, stables, storehouses, a hospital (now the Marin Headlands Hostel), a gymnasium, a post exchange or supply shop, a guardhouse (also used as a jail), a parade ground, two tailor shops, two barber shops and a bakery. The barracks – two rambling, three-story wooden buildings, one of which now houses the Headlands Center for the Arts – were some of the most modern in U.S. military history – a result of the Endicott Board’s desire to attract and retain soldiers. 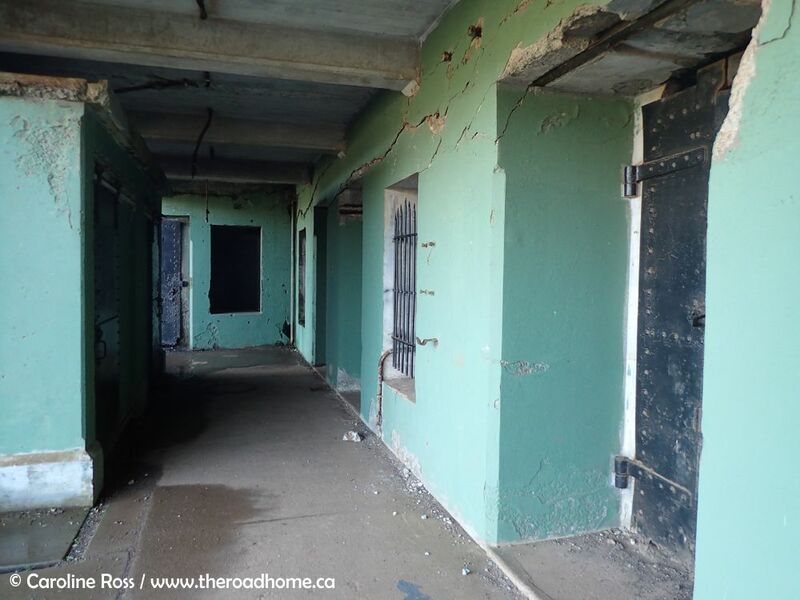 The barracks featured large, well-ventilated rooms, lots of windows, electricity, hot and cold running water, state of the art toilets and showers, and – a joy to those living there – real beds and mattresses. The barracks were a marked improvement over the drafty, cramped, unsanitary lodgings of older military posts. However agreeable its accommodations, Fort Barry was frustratingly remote. San Francisco, bright and bustling, teased from just across the water, and the only way to get there – or to nearby Sausalito, with its restaurants, saloons, railroad and ferry service to the big city – was by a long and treacherously winding coastal road. Soldiers risked the journey on their days off, but it took several near-fatal accidents before the dangerous route was replaced in 1918 by the Baker-Barry tunnel. Bored through 2,200 feet (670 metres) of solid rock, the tunnel still carries traffic on Bunker Road. Despite their isolation, the soldiers did have neighbours – the smattering of small ranches and dairy farms that littered the hills to the north and provided milk products to San Francisco. Soldiers often encountered wandering livestock in the scrublands, and took entertainment in corralling and returning the wayward animals. Cow capers aside, most soldiers filled their days with tedious, repetitive routines of training, maintenance and upkeep, punctuated by the excitement of test-fire exercises. On practice days, the soldiers would march across the windy headlands to their emplacements, plot the locations of mock targets, load and fire their guns, then evaluate the results – often via the network of underground communications cables linking the batteries. 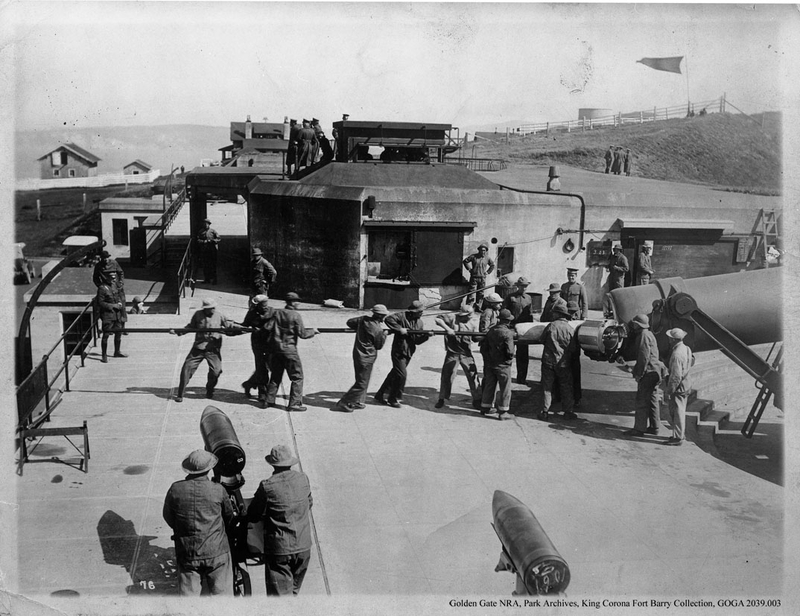 At Battery Mendell, it took six or more men to push the ramrod that loaded powder bags into the battery’s big guns. Despite the monotonous seclusion, many soldiers considered Fort Barry a prime posting. They had everything they needed – including modern conveniences – and were close enough to San Francisco to visit the big city, or receive guests, without too much hassle. 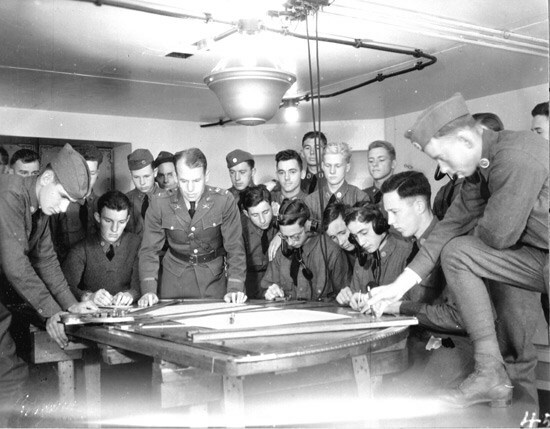 Fort Barry and the Endicott batteries saw little activity after World War I, but they were quickly pulled back into service during World War II, when the enemy threat came uncomfortably close to home. By this point, the port of San Francisco was vital to civilian, agricultural, industrial, economic and military activities in the Bay Area. People, food, commercial goods, soldiers, military equipment and ships of all ilk flowed in and out of the Golden Gate Strait on a daily basis. The Bay Area had to be protected at all costs. After the attack on Pearl Harbor in December 1941, soldiers around the Bay Area were put on high alert; for months, they kept their guns ready to fire at a moment’s notice. But the enemy did not appear, and America soon gained the advantage in combat. Land-based coastal defenses began to slip down the list of priorities, especially as the nature of warfare changed and the U.S. Navy grew in strength and capacity. 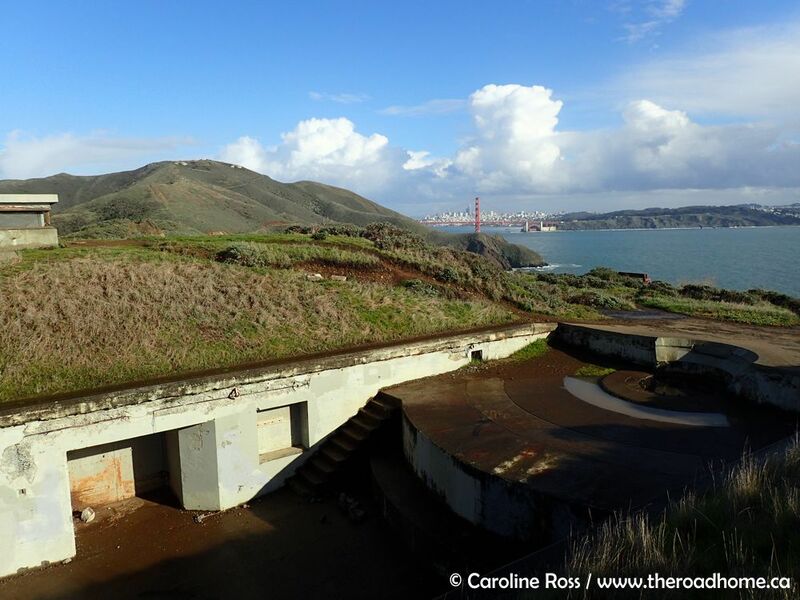 Between 1943 and 1946, the U.S. Army deactivated all coastal fortifications in the San Francisco Bay Area, including the five Endicott-era batteries in the Marin Headlands. The guns and mortars were removed and sold as scrap, and the last members of the Coast Artillery Corps left Fort Barry in the fall of 1946. The Corps was officially disestablished in 1950. 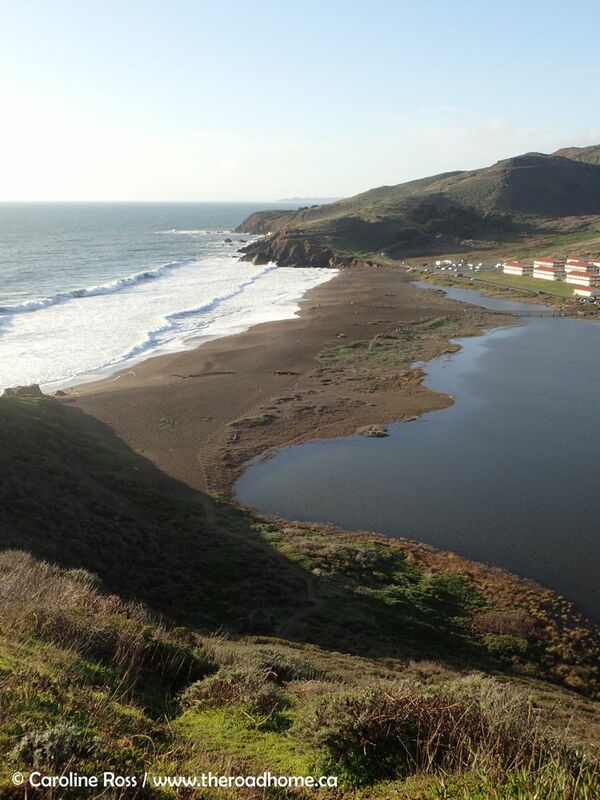 In the early 1970s, the Nature Conservancy purchased the former military holdings in the Marin Headlands from the Gulf Oil Corporation, which had tried, unsuccessfully, to develop the lands into a subdivision. 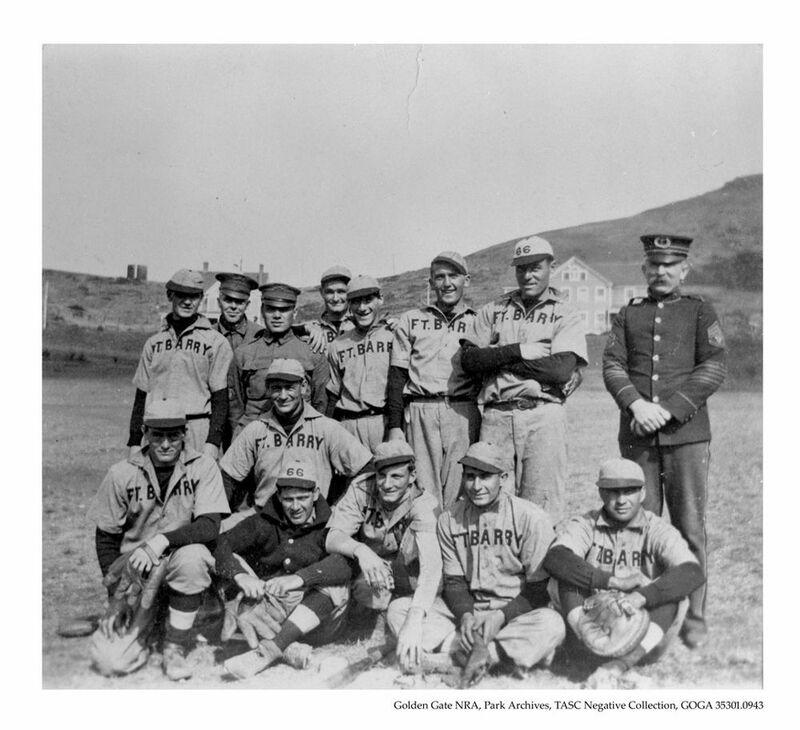 The Conservancy then transferred the lands to the National Park Service for inclusion in the newly created Golden Gate National Recreation Area. The National Park Service has chosen to preserve many of the old gun batteries and military structures as historic sites – which gives visitors like you and me the unique opportunity to stand atop crumbling ruins like Battery Rathbone-McIndoe, imagining what it must have been like for soldiers long-gone to marching through the scrubby hills, swing big guns into position and scan the swelling seas for enemy ships on the horizon. Battery Alexander: Colonel Barton S. Alexander, U.S. Army Corps of Engineers. Served with distinction in the Mexican and Civil Wars. Served as the senior engineer on the Pacific Coast until his death in 1878. Battery Mendell: Colonel George H. Mendell, U.S. Army Corps of Engineers. Senior engineer with a long and distinguished career planning and designing military structures. Supervised construction of many Bay area coastal fortifications. Died in San Francisco in 1902. Battery O’Rorke: Colonel Patrick Henry O’Rorke, U.S. Army Corps of Engineers. Native of Ireland and graduate of the United States Military Academy (West Point). Died at the Battle of Gettysburg in 1863. Battery Rathbone-McIndoe: Originally named for 2nd Lieutenant Samuel B. Rathbone, U.S. Artillerists. Died of injuries obtained at the Battle of Queenstown Heights, 1812. Divided and co-named in 1922 for Brigadier-General James McIndoe, Director of Military Engineering and Engineering Supplies, U.S. Army Corps of Engineers. Died in 1918, aged 51, at Bazoilles, France, during World War I. Battery Smith-Guthrie: Originally named for Captain Edwin Guthrie, 15th Infantry Regiment. Died in action at La Hoya during the Mexican War in 1847. Divided and co-named in 1922 for Colonel Hamilton A. Smith, U.S Infantry. Died in action in 1918, aged 47, near Soissons, France, during World War I. A gun battery is a collection of artillery devices (guns, mortars, rockets, etc.) co-located for efficient command, control and operation. The San Francisco fortifications were built in the Presdio and Sea Cliff neighbourhoods, and farther down the south coast at Fort Funston (west of Lake Merced). 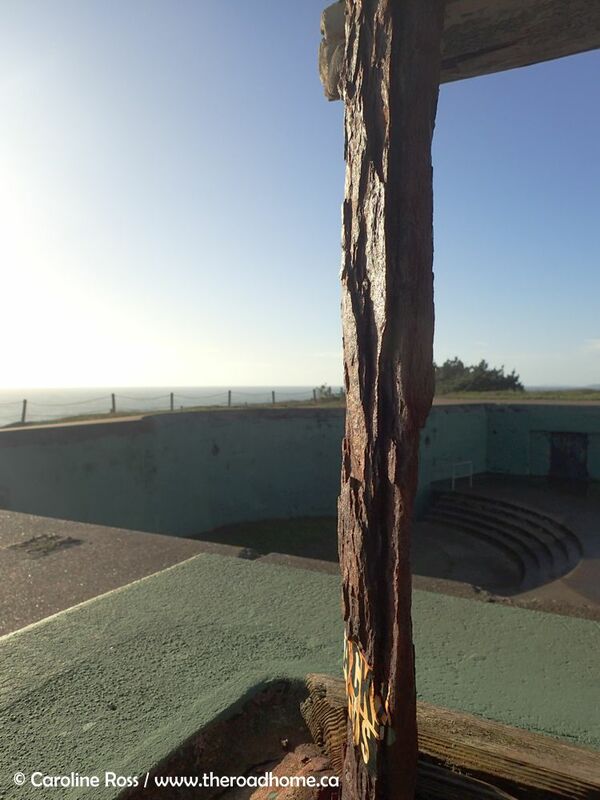 “Fort Barry History Tour: An Army Post Standing Guard Over the Marin Headlands,” National Park Service, U.S. Department of the Interior, p. 16. https://www.nps.gov/goga/planyourvisit/upload/sg-foba-army-2011_web.pdf; accessed on 14 February 2018. National Park Service, U.S. Department of the Interior, Golden Gate National Recreation Area. California Military Department, California State Military Museums, Historic California Posts, Camps, Stations and Airfields, Fort Barry. Last accessed 18 February 2018. 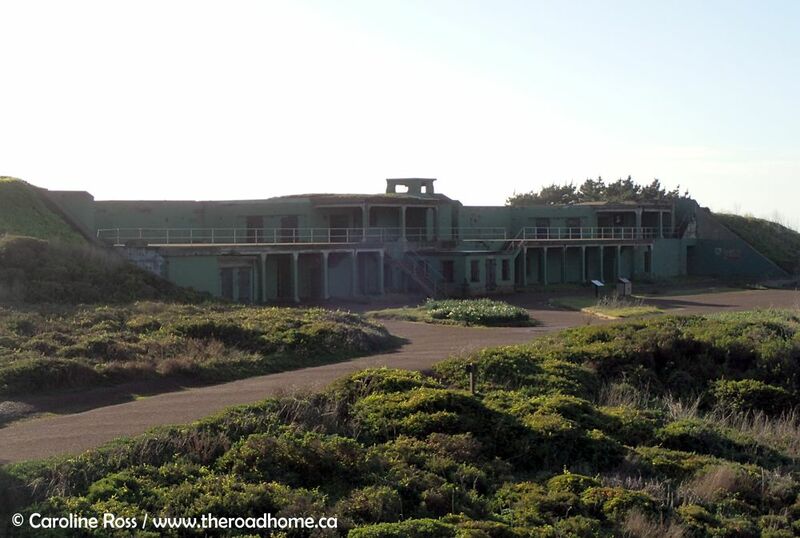 My father was stationed at one these gun emplacements in the late 30s. He had been in the Coast Artillery in Panama prior to being assigned to Ft. Barry. Somewhere I or my sister have photos and a unit Guide On flag. I wish I could remember which battery he was assigned to. He always said that after the fall of Singapore the army recognized that if the Japanese just attacked up or down the coast the gonna were useless. A submarine net and a few howitzers at the mouth of the Bay could stop ships from coming through the Golden Gate. Was @ a similar bunker type coastal defense set up near Portsmouth NH. The concrete bunkers look like sand dunes BUT they once house heavy caliber naval guns and ammo. There were still some steel tracks for moving shells. The also had some of these retractable type artillery pieces around Oahu & some of the concrete bunkers are still there not far from Waikiki.